Rabbi Tobias (Tuvia) Horowitz (1893-1942) spent his early years in Groysvardayn, in the house of his great-uncle, Rabbi Yisrael Hager, the Vizhnitzer Rebbe, tutoring his cousins Rokhele and Dvorele in Biblical Hebrew and Jewish History. While he got along with his great-uncle, he described the Hasidim as narrow-minded men who “persecuted” him for his broad-minded ideas. 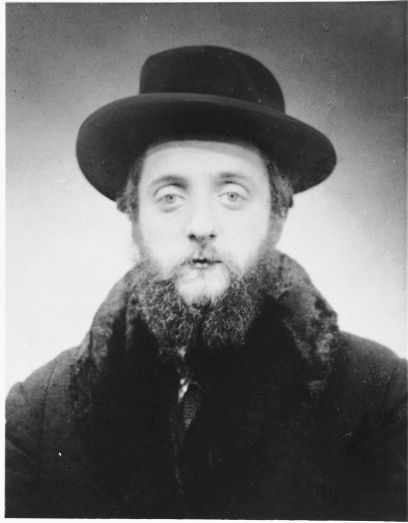 In Vienna in 1915, he met and forged a close relationship with Nathan Birnbaum; Rabbi Horowitz considered Birnbaum a spiritual influence, and he in turn helped Birnbaum forge connections with the Agudah (Birnbaum later served as General Secretary). After marrying the daughter of the the Admor of Ryboticze, Rabbi Tuvia Horowitz moved to Rzeszow, where he headed the Bais Yaakov committee (the Rzezsow Bais Yaakov was the third largest, after schools in Kraków and Warsaw). Rabbi Horowitz also served as Vice President of the Agudath Israel in Poland, and on the Executive Committee of Bais Yaakov and of the Agudah. He traveled to England in 1927 and was sent to the United States for two years in the late 1920s to raise $25,000 for the Teachers’ Seminary in Kraków . He left Rzeszow when he was accepted as the Rabbi and head of the Rabbinical court of Sanok. He was murdered, along with his brother-in-law Rabbi Tzvi Elimelech Horowitz and their wives and children, in Rymanów in October 1942.